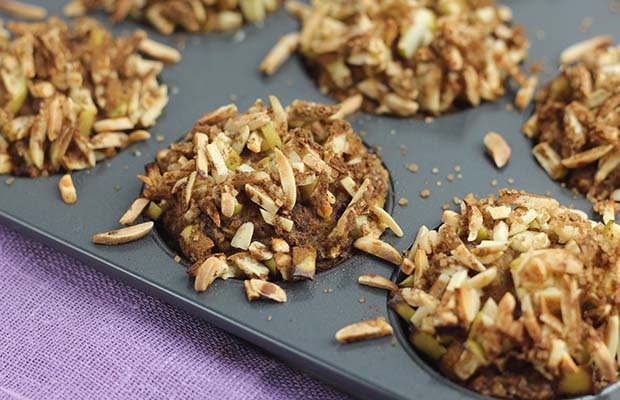 These vegan muffins are definitely hearty and delicious! In a medium bowl, whisk together ground flaxseed and water; let stand 2-3 minutes. Preheat oven to 375°F (190°C). Lightly coat nonstick muffin tins with cooking spray. In a large bowl, combine flour, oats, baking soda, 1/2 tsp (2 mL) cinnamon, nutmeg, allspice and salt. Add pumpkin, milk, 1/2 cup (125 mL) sugar, syrup, and oil to flax mixture; stir until well blended. Combine the pumpkin mixture with the flour mixture and stir until JUST blended. Do not overmix. Divide evenly among 12 muffin tins, (the cups will be very full. ), and top with apples and almonds. In a small bowl, combine the remaining 2 Tbsp (30 mL) sugar and 3/4 tsp (4 mL) cinnamon; sprinkle evenly over all. Bake for 25-26 minutes, or until a toothpick inserted into the center comes out clean. Let stand in the pan for 10 full minutes. Carefully remove and cool on wire rack. May substitute the 1/2 tsp (2 mL) cinnamon, 1/2 tsp (2 mL) nutmeg and 1/2 tsp (2 mL) allspice with 2 tsp (10 mL) pumpkin pie spice, if desired.